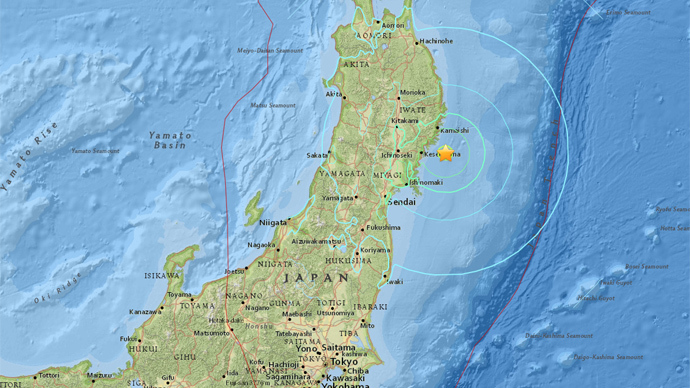 A 6.8 earthquake has struck off the eastern coast of Japan’s Honshu Island, shaking the same area devastated by a quake and tsunami four years ago, USGS and Japan Meteorological Agency report. No casualties or damage have yet been reported. The quake struck at 6:13am local time at a depth of almost 50 kilometers. While USGS originally reported the quake at 6.9 magnitude, JMA measured it at 6.6.No casualties or damage have yet been reported. No tsunami warning was issued by JMA and according to the Pacific Tsunami Warning Center, based on all available data a “destructive pacific-wide tsunami” is not expected. No warning has been issued for the US state of Hawaii. No abnormalities were reported at the Fukushima nuclear power plant, which was crippled by an earthquake and tsunami in 2011. However, some trains were reportedly delayed on the Tohoku Line between Fukushima and Sendai prefectures following tremors.Onagawa and Higashidori nuclear power plants also reported no abnormalities.